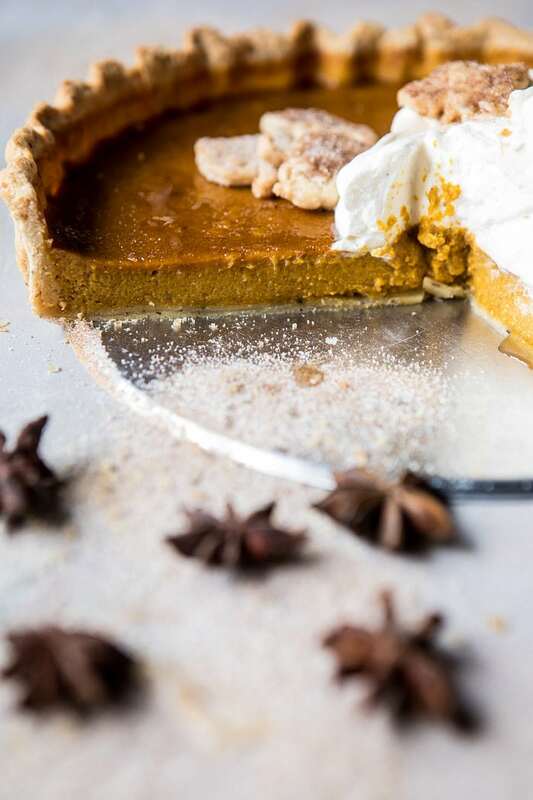 If there’s one thing you need today, it’s a slice of this Chai Pumpkin Pie with Maple Whipped Cream. I mean, it is Friday, and it is November, so I think some pumpkin pie is totally acceptable for today. In all seriousness here, we are now less than two weeks out from Thanksgiving (what?!? how?!?). Which can only mean it’s time to talk pumpkin pie. Believe it or not, I have yet to share a pumpkin pie recipe with you guys. To me, this seems a little crazy, and when I realized this fact, I knew this Thanksgiving needed to be the year I changed that. One of the reasons I think I have not shared a pumpkin pie recipe before is honestly because it’s just never really excited me. As you guys know we are major chocolate people over here and I definitely did not grow up eating pumpkin pie. That said, over the years of developing recipes and trying out new things, I have discovered I do in fact enjoy the sweeter pumpkin recipes. See these Pumpkin Butter Rugelach Cookies, this Cream Cheese Swirled Pumpkin Coffee Cake, and this Pumpkin Spice French Toast. 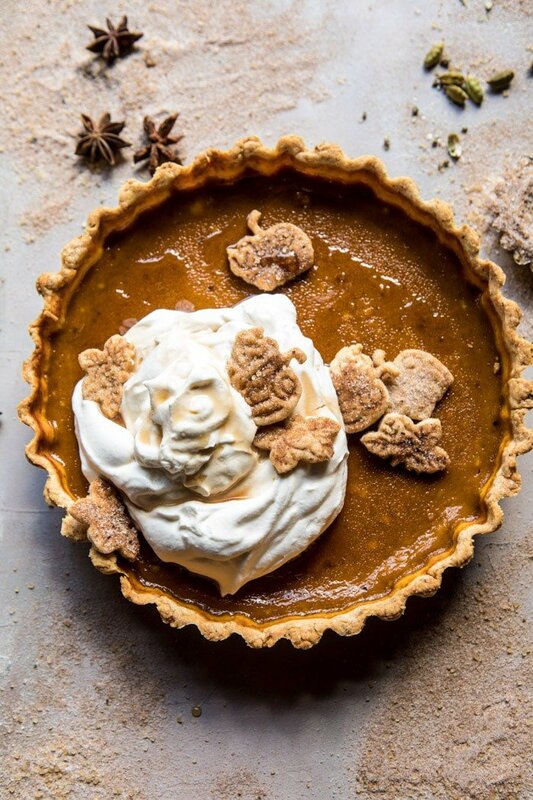 Until I dreamed up this chai spiced pumpkin pie with maple whipped cream. Oh man. Oh man. This is how pumpkin pie needs to be made. 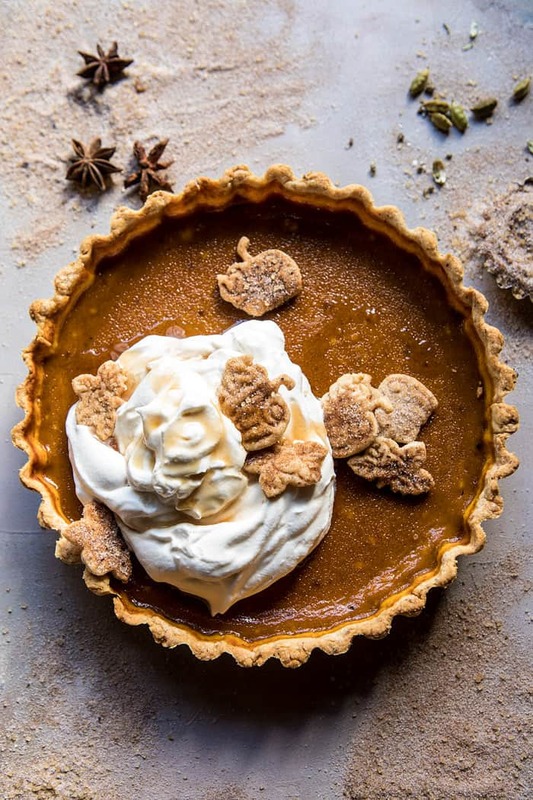 Like most, I am pretty head over heels for Chai flavored anything, but the thought of a Chai Spiced Pumpkin Pie…and with maple whipped cream too, yeah, that just sounded way too good. So I did what I do and I started testing out my Thanksgiving pie recipe. 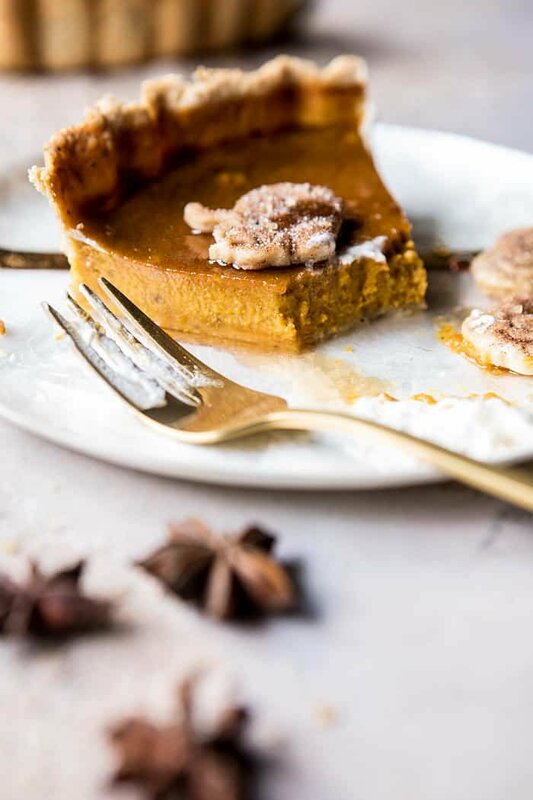 Most pumpkin pies I’ve tried have been overly sweet and lacking in pumpkin flavor, so with this pie, I wanted to really highlight the pumpkin flavor and not create something so sweet that you can’t taste anything else. I used mostly maple syrup to sweeten this up, which I think pairs so nicely with pumpkin. I then added in a homemade chai spice mix, plenty of good vanilla extract, and a little heavy cream to keep the pie silky smooth. 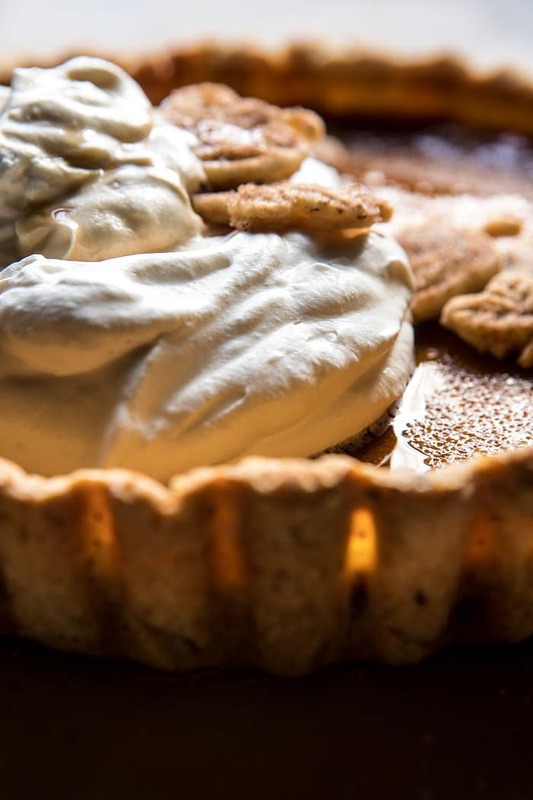 Still pretty traditional, but it’s that chai spice mix that makes this pie over-the-top good. The use of maple syrup in place of sugar makes this pie almost healthy-ish. Meaning the guilt for this pie should be non-existent…if you’re asking me anyway. To finish off the pie, I made a simple, but delicious maple whipped cream that’s the perfect sweet and creamy balance to all the serious pumpkin and chai flavors happening in the pie. The secret to my whipped cream though? Using Land O Lakes® Heavy Whipping Cream. 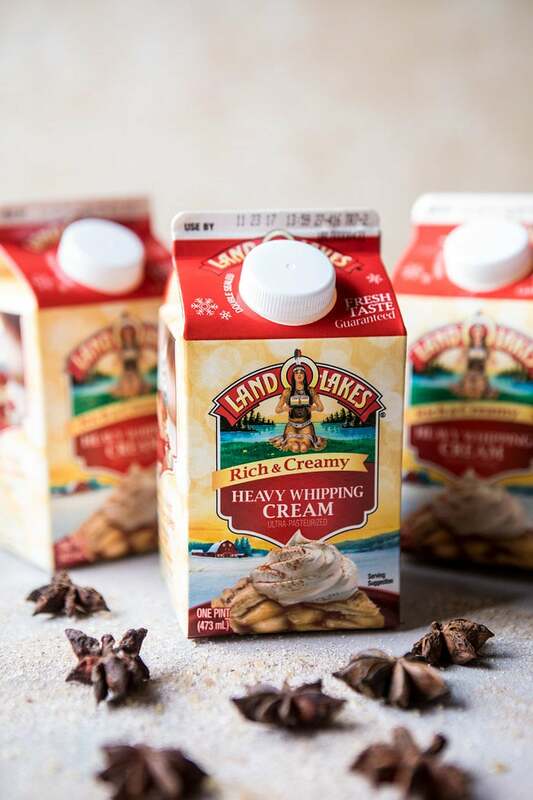 I love using Land O Lakes® Heavy Whipping Cream because it always guarantees me perfectly rich and creamy whipped cream every single time. It’s one of those staple ingredients that I usually have in my fridge at all times, but especially during the holidays. In a lot of ways, this pie is very similar to your favorite chai latte, but with plenty of pumpkin and a generous dollop of whipped cream. I don’t know about you guys, but I’d choose pie over a latte any day. My plan is to serve up this chai pumpkin pie at this year’s Thanksgiving. 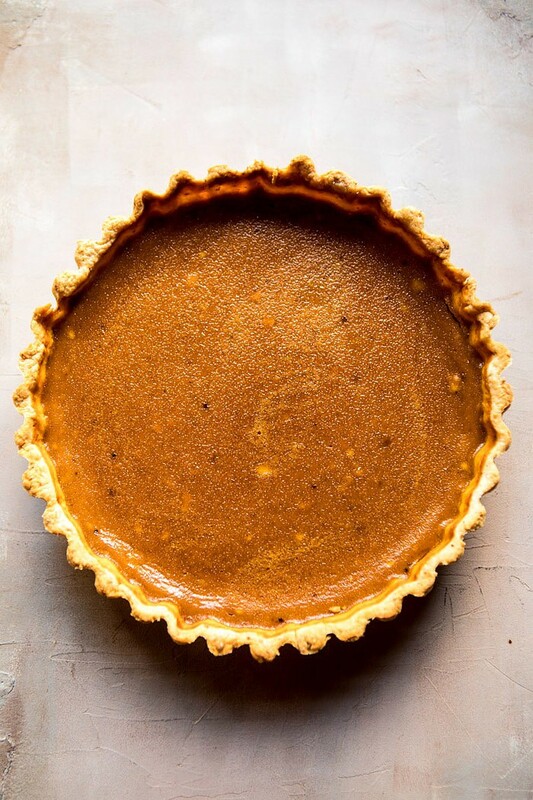 Not going to lie, it’s going to be the first pumpkin pie I’ve put on my Thanksgiving pie table, but I feel pretty good about it, because I really do adore this recipe. 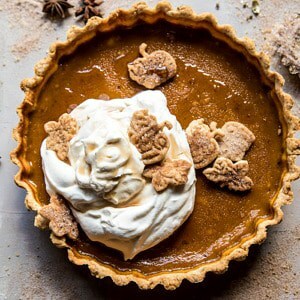 It’s loaded with all my favorite pumpkin and chai flavors, perfectly sweet, and lusciously creamy. Plus, I’ll be cooking Thanksgiving dinner for my grandpa this year (something I don’t normally have the chance to do) and the man loves a good pumpkin pie. I cannot wait to share this one with him, he’s going to love it, which has me all the more excited. Sweetened with mostly maple syrup, which pairs so nicely with pumpkin. I then added in a homemade chai spice mix, plenty of good vanilla extract, and a little heavy cream to keep the pie silky smooth. Still pretty traditional, but it's that chai spice mix that makes this pie over the top good. 1. Preheat the oven to 375 degrees F. Grease an 8-inch pie plate with butter. 2. Fit the pie crust into the prepared pie plate. 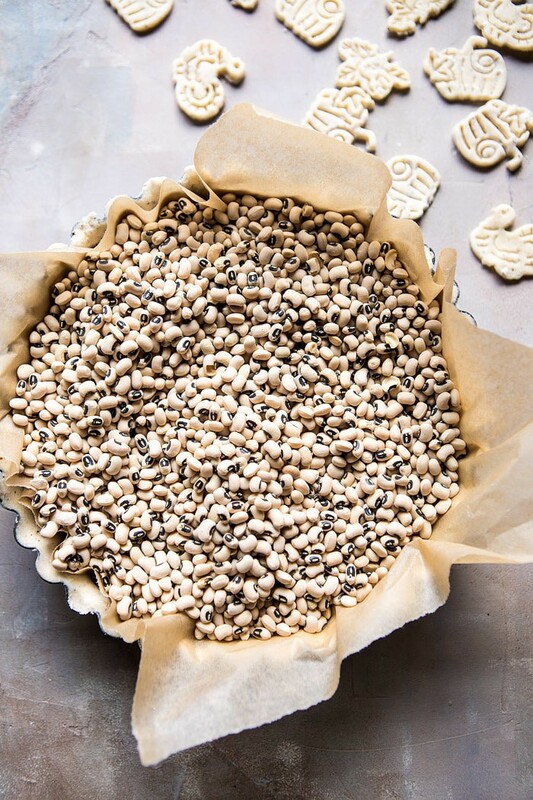 Line the crust with parchment paper and fill with pie weights, beans or rice. Transfer to the oven and bake until crust is set, 30 to 35 minutes. Remove pie weights and continue to bake until the crust is golden, about 10 minutes. Remove from oven. Reduce the oven temp 325. 3. To make the pumpkin filling, mix together the pumpkin, heavy cream, eggs, maple syrup, brown sugar, vanilla, cinnamon, ginger, nutmeg, cardamom, cloves, salt, and pepper in a mixing bowl until combined. Pour the mixture into the baked crust. 4. Transfer the pie to the oven and bake for 50-55 minutes or until the center no longer jiggles. Remove from the oven and let cool, and then place in the fridge to cool completely. 5. Using an electric mixer, whip the cream until soft peaks form. Add the maple syrup and vanilla bean. Whip once more until combined and fluffy. 6. 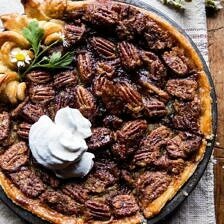 When ready to serve, top the tart with the maple cream and sprinkle with chai sugar, if desired. Slice and serve! That up there? The perfect slice. Cream of Pumpkin Soup with Maple Pecans. So sweet you’ll be baking this for your grandpa! This is definitely a worthy pumpkin pie. YES! I hope you love this Liz! oooooh i GOTTA try this one!!! Agreed! I hope you love it! Thank you Ruth! This looks stunning! Regular pumpkin pie elevated to something spectacular. Your Grandpa is gonna love it. I think so too! I am really happy you like it as well! Thanks Debs! My mom used to own a restaurant. Her big sellers were pies. She made her own crust, her own recipe of coconut, chocolate, banana, pineapple, and peach cream pies. Her sweet potato pie was the best I have ever eaten.I know she made pumpkin close to Thanksgiving but it was not one I ever cared for. I still am not a pumpkin person so I switch to sweet potatoes in some recipes. Your grandpa will love you cooking for him. Awh that sounds so amazing Charlotte! Totally wish I could taste her sweet potato pie, I bet it was really good! Thank you! This pie looks amazing. It combines my two favourite things pumkin and chai latte. Yes perfect! I hope you love this! Thank you! I’m so gonna make this when my daughter comes home from college. It combines her two favorite things, pumpkin pie and chai!! But did I miss something because I don’t see the chai sugar recipe?? Yes, I was also looking for a link to the optional chai sugar to sprinkle on top, as mentioned in the instructions. I’m looking forward to making this for the family next week in the RV! This sounds amazing! I love both pumpkin pie and chai. However…..more than an hour and a half of total baking time for a pie crust sounds like way too much. Granted, I am not an expert on crusts and usually buy the pre-made ones. Clearly it would have to be covered so it doesn’t over brown, but wouldn’t it end up incredibly dry? Yours looks beautiful and not dry at all. I was thinking of doing a pumpkin pie with a phyllo crust this year. Thinking that might work great with this filling! Pinned and added to my Thanksgiving menu! I’ll for sure be making this! Would love to make this for Thanksgiving, sounds fantastic! I have a friend with a cow allergy, so what can I switch out for the cream? Already have the recent Brussel sprout and the salad from yesterday on the roster! 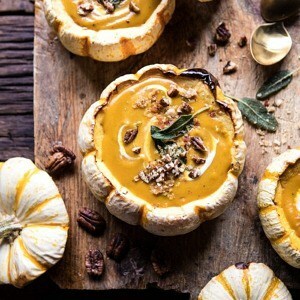 I’m not really into pumpkin pie either, but this one looks positively heavenly! Have a great weekend, Tieghan! Thank you Natasha! I hope you have an amazing weekend! Looks like another winner. Can’t wait to make it. This looks so great and I can’t wait to try it. I LOVE pumpkin pie, as does my sweet DIL. So FOR SURE it’s going on the Thanksgiving dessert table. Could you please share your source for the cute cookie cut out decorations? I love how everything you make looks so dang a m a z i n g! ! ! ! 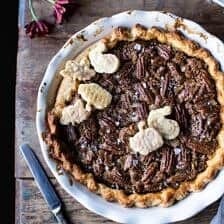 this pie is at the top of my holiday pie baking list…it’s beautiful and I can’t wait to make it and share with our family!! I too would love to know where the source of the very cute cutouts you used? Thank you so much for sharing the recipe! If I doubled the recipe could I do this in a spring form pan? 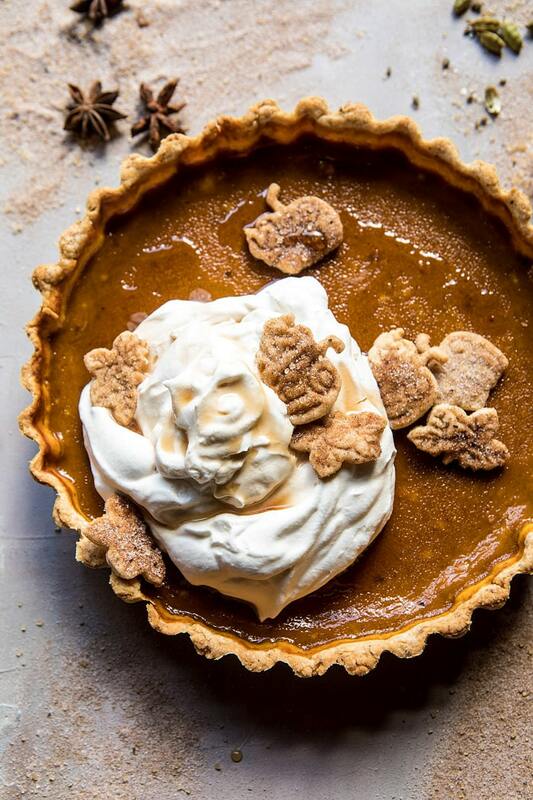 This pie looks beautiful and made me smile when I saw the cute little pumpkin crusts. I love the chai spice and maple whipped cream and think this looks lovely. I hope you had a wonderful rest of your trip and a safe flight back! Also, I hope your thanksgiving pie turns out perfect for your grandpa. I’m sure he will love it and the thought of you baking something he enjoys. 🙂 I’m looking forward to more Thanksgiving and November recipes and your favorites post this week! Stay warm. Hi Kristin! I am so glad you like this pie! Thank you so much! Have a great week! I’m not a fan of pumpkin or chai, but somehow I can’t shake the feeling that I would love this! Try it and let me know!! I hope you do end up loving it Leslie! Hi, it seems this particular ‘chai’ spice mixture differs from traditional? 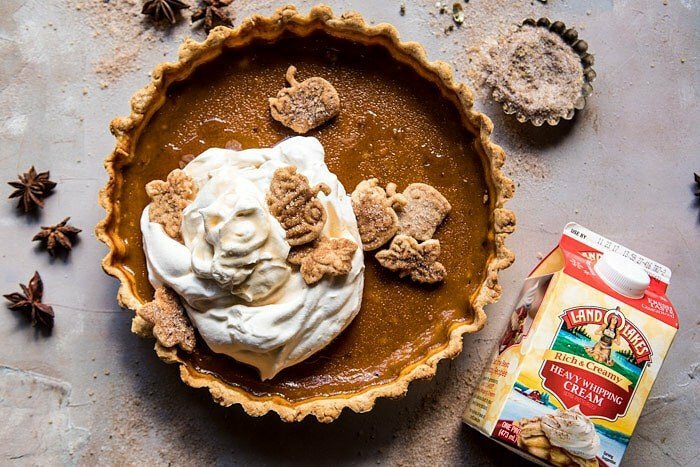 My question should have been this: how is chai spice blend in this pie differs from traditional ‘thanksgiving’ spice mixture that we normally see in pumpkin pies? I made this last weekend. I mixed the ingredients like a more traditional recipe, spices with sugar in small bowl then whipped eggs with whisk, whisked in pumpkin, cream, vanilla, and then the spices. Mine seemed lighter and higher than the photos here.The flavor was amazing, great recipe! I am really happy you enjoyed this Kristine! Thank you! 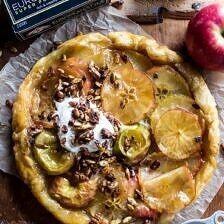 Hi, I want to make this pie, but I don’t see recipe for chai sugar. Should I use recipe for chai pumkin snickerdoodles? Looks great! I might make this for Christmas since (gasp) I’ll be out of town on Thanksgiving. 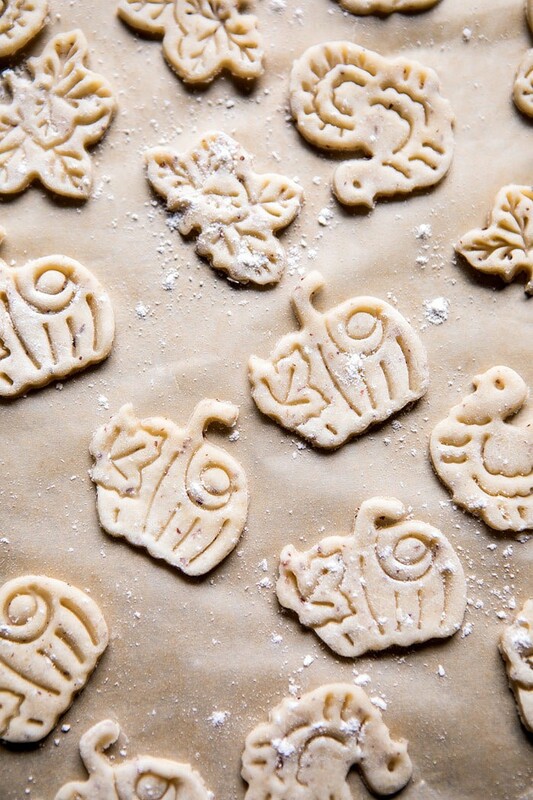 Which recipe did you use for the little cookies? Where is the chai sugar? I do not see the recipe. Made this yesterday and my husband has declared it the best pumpkin pie he’s ever had–so delicious, thank you! Perfect amount of sweetness and spice. That is amazing! Thank you so much Kelly! I don’t see the recipe for the Chai Sugar topping at the end. Hi Liz! Sorry about that. Here is the link to it! Hope you love this pie! Is there anyway to substitute the cream for something without dairy? I am so excited to bring this tomorrow for my first thanksgiving with my boyfriends family 😳😬😂 how would you recommend baking the decorative crust pieces?? OMG!! Thank to you. This recipe is jist what I needed. The perfect way to put a pumpkin over the top. I’ve been looking for a different recipe and adding chair spices WOW, so genius! The last few years I’ve been making a salted caramel pumpkin pie which has beenca huge hit with pumpkin lovers and haters alike. I can’t wait to try this one out….for me. Sooooo excited! I hope you absolutely love this recipe Faith! Thank you so much! Hi, Happy Holidays! Thank you for sharing this recipe. Looks like my pumpkin pie prayers have been answered! I just wanna be sure of what kind of pepper to use in the recipe. Please let me know. Can’t wait to bake this one up. I know your grandpa will LOVE it!!! Wow! I made this pie today for Thanksgiving and it is the best pumpkin. pie I have every made. The texture was smooth and creamy, almost like a flan, and the ingredients were very well balanced. It wasn’t too sweet. Thank you! It is a wonderful recipe! Thank you Joyce! I am glad you enjoyed this! This is delicious! The flavors really work well. I made a few changes (just based on my pantry) – I used a graham crust which was smaller so did 2/3 of the recipe. I used evaporated milk instead of cream. I didn’t have any dry ginger but had fresh so I chopped and muddled some into a mug, added the milk then warmed quickly and let it sit and infuse for a while. I also used homemade pumpkin purée and baked how I usually do – 375 for 15 mins the. The remainder at 325. I think this will be in the Thanskgiving rotation next year. Thanks for a great recipe! Thank you Laura! I am so happy you liked this! I made this for Thanksgiving and it was a HUGE hit! I’ll definitely make it again. Hi, just wondering how far ahead I can make this. Hoping at least one day will be ok? Can’t wait to try it! Hi Tieghan, I’m hoping to make this for Thanksgiving! I just wanted to confirm that it’s written for an 8 inch pie dish. I only have 9 inch so I may have to do some math! Can I bake this chai pumpkin pie ahead of time and freeze it? I’m interested in making this pie without any sugar. Would you recommend increasing the amount of maple syrup? Thank you!